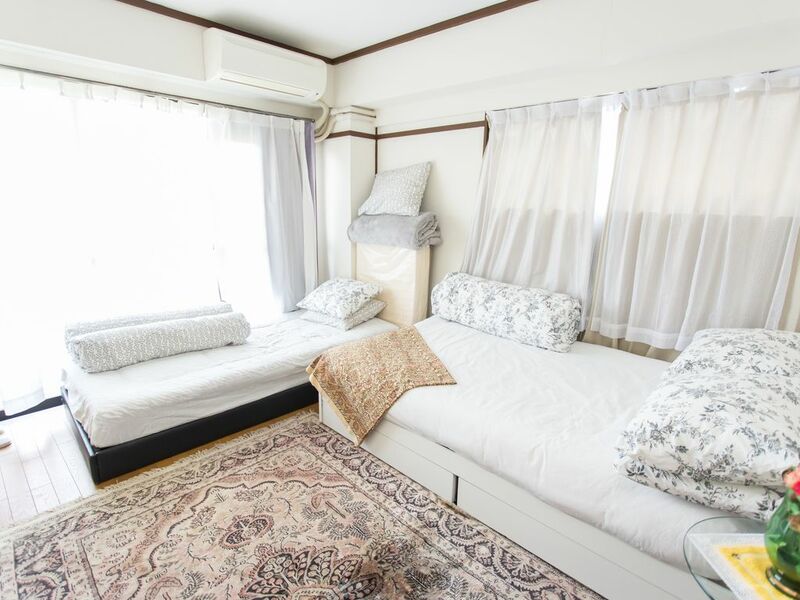 This apartment is located in the center of many amazing hotspot areas of Tokyo. You can walk to all of these places within 5 to 10mins and enjoy all they have to offer. The apartment is fully furnished to a high standard. This apartment is located in one of the greatest hotspot areas of Tokyo and Shinjuku ,A pocket WiFi which you can carry with you anywhere you go. Gas stove all no extra cost. A spacious fully equipped kitchenette. Shinjuku is one of the 23 city wards of Tokyo,And one of the lager entertainment , business and shopping area around Shinjuju station. Shinjuku station is the world's busiest railway station,handing more then two million passengers very (website hidden) served by about a dozen railway and subway lines,including the JR Yamanote Line.Shinjuku is also one of the Tokyo's major stops for long distance; Highway a Buses and City Buses. West of the station is Shinjuku's skyscraper district, Home of many of Tokyo's tallest buildings,including the Twin Towers of the Metropolitan Government Office; Whose observation decks are ion to the public for free. Shinjuku is a very popular district among tourists to stay thanks to its convenient location and abundance of shopping,entertainment and sightseeing opportunities.Many excellent restaurants are located among the Skyscrapers on the station's west side,while many cheaper options are concentrated on the east side and around the Kabukicho Red light district. The apartment is just 10 minutes away from all the hotspot areas; On train is just 10minutes only. It's the trendiest city of Tokyo but not only the nightlife gives it a special buzz, it also has top class hotels, restaurants,bars,clubs, movie theaters and world famous museums. Northeast of the station lies (Kabukicho) Japan's largest and wildest (Red Light district) while department stores,subterranean malls and electronic shops surround Shinjuku station on all four sides, including the recently redeveloped Southern Terrace. Shinjuku and Shibuya station is the world's busiest railway station,handing more then two million passengers very (website hidden) served by about a dozen railway and subway lines,including the JR Yamanote Line.Shinjuku is also one of the Tokyo's major stops for long-distance; Highway a Buses and City Buses. I don't interfere or disturb their holidays.I just want them to enjoy every moment of their time here in Tokyo. I am always available whenever they need help but do not visit the apartment unless requested to do so by guests. The place is very convenient in everything that would someone be in need of. Transport wise 2 to 4 minutes walk plus shops too.